Dar Bounouar Location. 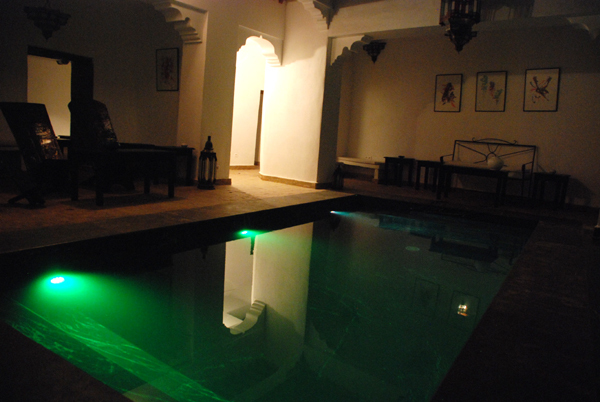 Book Dar Bounouar Today with Hip Morocco - Holiday Accommodation in Marrakech, Morocco. "Beautiful riad which offers exquisite accommodation and professional service..."
Dar Bounouar is a beautiful riad located in the old Medina of Marrakech. It offers exquisite accommodation and professional service as well as excellent food. 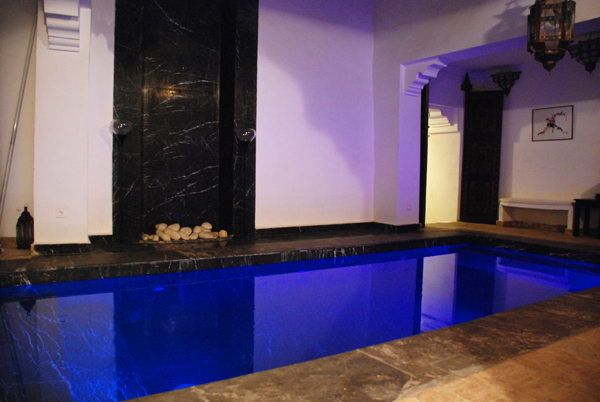 Dar Bounouar has a swimming pool and a hammam. 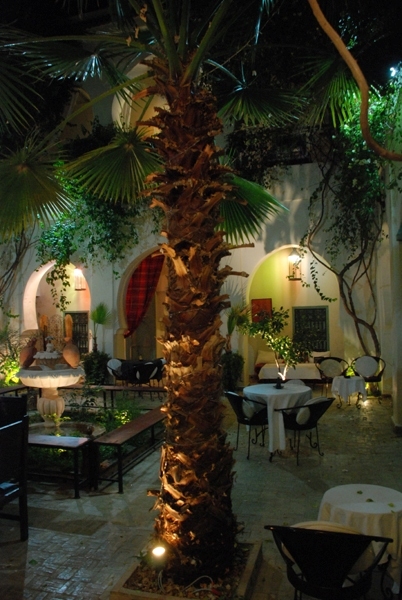 The on site restaurant in this charming Marrakech property offers succulent and innovative Moroccan cuisine. 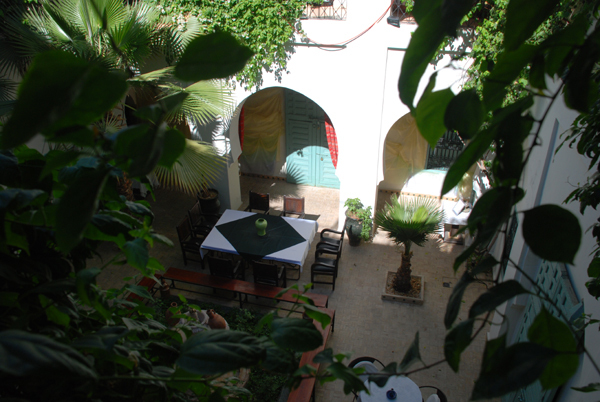 There are six luxurious rooms and five junior suites at Dar Bounouar. These rooms are tastefully decorated and very well equipped. Each room has a safe and comes with internet access. The bathrooms are exclusively designed and have beautiful marble features. 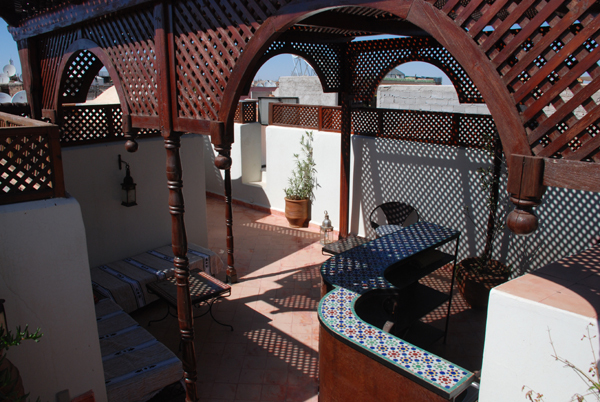 Guests can relax and enjoy panoramic views of the red city from the terrace. There is also a patio with a pool. At Dar Bounouar, discreet and dedicated staff is always on hand. 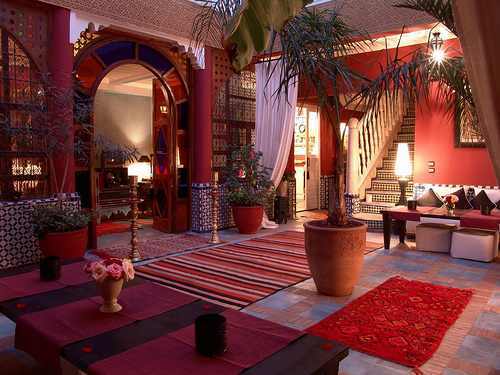 This tranquil riad is an ideal base from which to discover Marrakech and its treasures. Base prices are in Euro: £Sterling, USD and Moroccan dirham rates will vary by exchange rate. Breakfast: We offer a selection of fruit, eggs and local hand made Moroccan breads, pancakes, and yoghurt. Breakfast is varied on a daily basis to keep it interesting. Lunch: Is available on request with a variety of light options including child friendly meals. Dining in house: The on site restaurant in this charming Marrakech property offers succulent and innovative Moroccan cuisine. 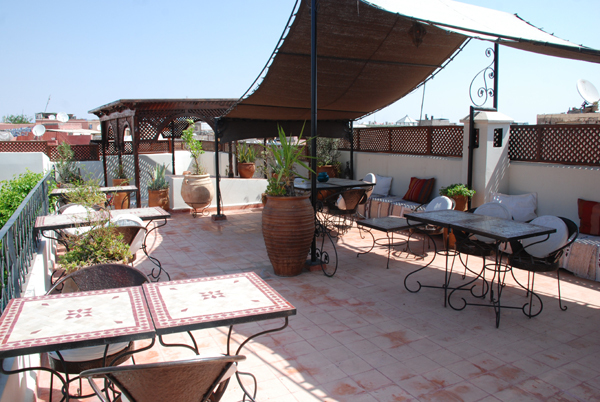 This has a fine Indian restaurant 'Des Jardins de Bala' on the roof terrace, good for vegetarians and meat eaters alike; Restaurant Marocain for a traditional Moroccan experience. It also has a great pool side eating area where you can get good light lunches at less than £6-£7 each. And a lovely Piano bar for coktails in the evening. Very popular with great views over the square. I have never eaten there so I can’t comment on the food, but a great location. A large eaterie at night, popular to many, very cheap, fresh food, avoid the salads. Not to everyone’s taste. You can now download the Hipmarrakech App to your iPhone or iPad. 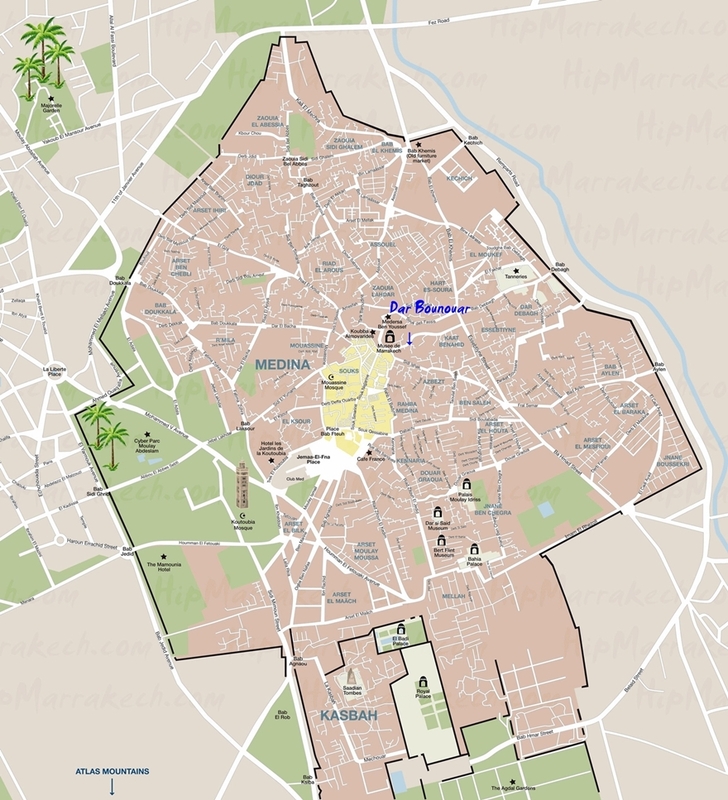 This gives a map of Marrakech which does not require data roaming so you can navigate the Medina without getting lost and always being able to find your Hipmarrakech Riad or Hipmarrakech Hotel. The Hipmarrakech App also gives 10% discount at selected restaurants and shops. 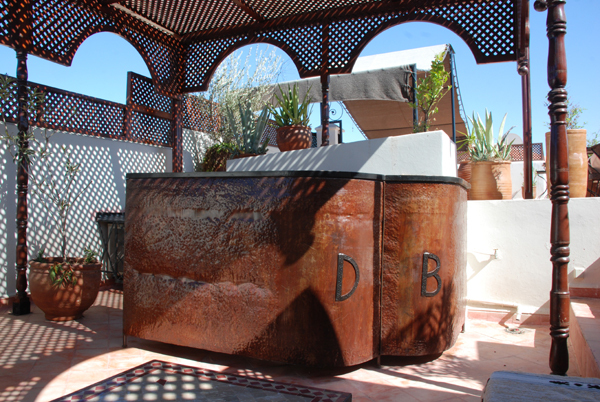 "I went, my wife and I at the dar bounouar for about one week and it was amazing ! We came from Maine and we love discover landscapes and different places! There is a lot of sights seeing as the jeema el fna place for example. I mean everybody were really friendly and welcoming with ! I went hiking on the atlas mountain during one day and we really enjoyed our trip ! Thank you so much to everyone of us guys ! See you soon, I hope we're gonna come back as soon as possible !" "We were greeted by a man with a cage on the back of his bicycle, who took our bags and led us through some small streets to get to Dar Bounouar. Upon arrival we were given a couple of cold beers and shown around the wonderful riad by Christian, the owner. 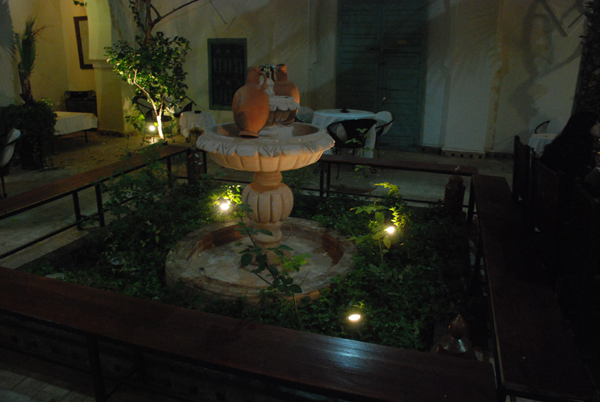 The riad was wonderfully relaxing. We had the whole place to ourselves. The terrace had four poster beds for us to lounge in the sun, then when it got too hot we would relax around the plunge pool in the courtyard. The surroundings and decoration of the whole building was beautiful and tasteful with lots of greenery and romantic seating. Our room was also lovely, it had TV, wireless, air conditioning and was very spacious. The bathroom was also beautiful however, the shower wasn't very powerful- the only complaint to the whole place." 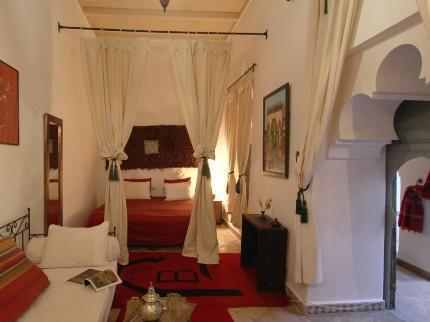 Dar Bounouar has 4 Standard rooms that can sleep 2 guests. The en suite bathroom offers tadelakt walls and a hairdryer. The 2 superior rooms are more spacious and can accommodate a third bed in comfort. The rooms are air conditioned and uniquely decorated. Other features include satellite TV, a seating area and wardrobe. The en suite bathroom offers tadelakt walls and a hairdryer. 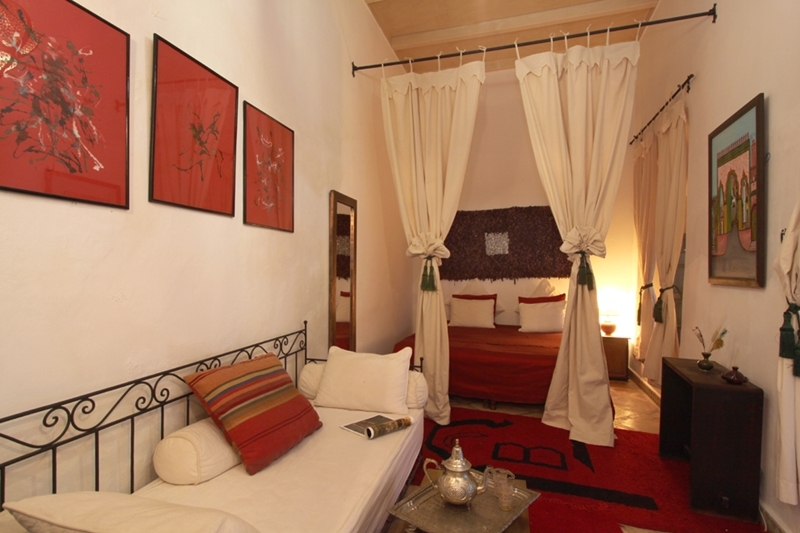 There are 5 junior suites at Dar Bounouar, each can accommodate up to 3 people. The junior suites are fully air-conditioned and offer satellite tv, a seating area and wardrobe. The en suite bathroom offers tadelakt walls and a hairdryer. The base rate price at Dar Bounouar is in pounds, euros, or Moroccan dirhams and exchange rates are approximate.